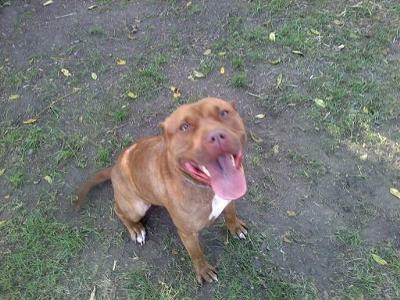 Hi, I have a 5 year old red-nose pit bull terrier named Lilly that I adopted from a local animal shelter. I knew that she didn't really like other dogs when i adopted her. My neighbors and I live really close together and they have a newfoundland. When we got our pit, we took her out on a leash along with the neighbors dog to introduce them on "neutral territory". They like each other just fine. And our dog also likes our other neighbors rottweiler. Our neighbors with the newfoundland got a german shepherd a few months after this, and no proper introduction was done. I'm guessing because it just wasn't planned by both parties...anyway our pit bull does NOT like the german shepherd at all. He is very barky and obnoxious and our pitbull seems to only like submissive type dogs. Maybe she would've been ok if a proper meeting was done. I'm not sure if she feels threatened by strange dogs or not. But the main problem is when we are walking our pit bull and she sees other dogs, her hair stands up on her back and she starts growling and barking and wagging her tail, and tries to pull towards the other dog. It's sometimes difficult to redirect her attention to me. I'm not sure if there is any other way to help Lilly with this problem. any tips on how to deal with dog aggression or whatever this is? Dog aggression isn't typically an all or nothing proposition. So, Lilly's history of liking some dogs and not others is perfectly normal. And, as you've experienced, taking charge of the initial meetings between dogs that are going to be encountering each other regularly can help pave the way for tolerance, even friendship. Kudos to you for the way you've worked with her on this. With dogs she sees on the street, it's different. It doesn't really matter whether she likes them or not. The bottom line is you want her to pay attention to you--not them. like the perfect lady or being a pistol has nothing to do with the affection she has for you. Bonding in the sense I'm using it here has to do with the extent to which Lilly looks to you to know how she should respond in a given situation vs. acting purely on her own instincts. If you take the opportunity to stand back and observe the goings-on at an off leash dog park, you'll notice that some dogs explode on to the scene and become totally immersed in their surroundings. And, for the time they are there, it's almost as if their owners don't even exist unless the owner calls to them or approaches them. You may also notice some other dogs who confidently explore the area, play with other dogs, but check in with their owners from time to time--either by circling around to them or by visually scanning the area to see where their human is. The dogs do this on their own initiative--not because the owner is calling them. These dogs have established a stronger bond to their owners than the first group. And, this is something that can be cultivated. A book I'm reading right now and really liking deals with just this aspect: Bonding with Your Dog - A Trainer's Secrets for Building a Better Relationship. The other angle I would address is that you need to condition the behavior you want from her in the presence of other dogs. I know you've found this difficult to do up to now. Bonding exercises should help. But, in the meantime, you also want to reward her any time she "gets it right". If you want to read something specific about working with aggression, you may find this book helpful: Click to Calm - Healing the Aggressive Dog. Good luck to you and Lilly. She's a beautiful dog and you're doing a great job of socializing her. Feel free to post back here if you have more questions. your dong and mine could pass as the same dog almost! shes adorable. my girl has the same issue likes some dogs not others so i know wat its like dealing with that.